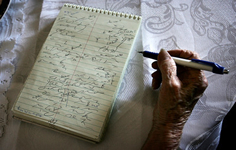 Stella Butterfield, who has been a court reporter in Las Vegas since 1953, uses what she calls “Greggbutterfield” shorthand, a combination of her own design and John Robert Gregg’s system, developed in the 1900s. 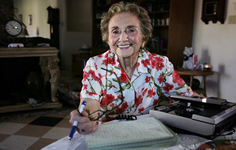 At 83, the Las Vegas resident is the only remaining court reporter in Nevada who uses a pen. which includes meeting with a personal trainer twice a week. Butterfield doesn’t actively solicit business anymore, but she maintains a listing in the Yellow Pages and works an average of three days a month. Many of her regular clients have died or retired. “I honestly thought I’d quit reporting after 50 years, and now I’m going into 58 years,” Butterfield said. These days, she focuses much of her energy on marketing The Widow Butterfield’s BBQ Sauce (“Taste to die for!”). And she recently was invited to join a court reporters delegation to South Africa in conjunction with the People to People Citizen Ambassador Programs. Butterfield said she considers the invitation an honor for both herself and Nevada, and she plans to raise the $6,000 necessary to make the trip in November. Delegation leader Merilyn Marquardt-Sanchez of Phoenix, past president of the National Court Reporters Association, said candidates were selected based on several criteria, including their geographic location, their specialty in the field, and their level of experience. “We wanted a good cross-section of our profession,” she said. They also must belong to the national association, which has about 23,000 members. Marquardt-Sanchez said People to People management made the selections and invited 800 people. She led the two prior delegations of court reporters, one to China in 2007 and one to Russia last year. Marquardt-Sanchez hasn’t met Butterfield and didn’t know she was a pen writer. “That’s even better,” she said. “I think it’s wonderful to be able to have an example of how, if you don’t have the funds for the advanced technology, that they don’t have to go without the ability to make a verbatim record,” Marquardt-Sanchez said. Stella is the only court reporter in Nevada who still uses a pen and notebook. And without the need for fancy equipment, Butterfield “has a lot more flexibility,” said Marquardt-Sanchez, who knows of only a handful of pen writers in her organization. South Africa has no formal court reporting system, but the courts and schools have expressed an interest in developing a training program for stenography. Adrien Fox, spokesman for People to People Citizen Ambassador Programs, said he does not know how many court reporters from Nevada were invited to join the delegation. A typical delegation consists of about 35 to 40 people. People to People International was founded in 1956 by President Dwight Eisenhower as a vehicle to expand international relations beyond the structure of government agencies. The nonpolitical, private sector organization is dedicated to promoting international peace and understanding. As a longtime member of Soroptomist International of Greater Las Vegas, she also hopes to contact other Soroptomist members in South Africa. The New York City native began her court reporting career in June 1951 in the Panama Canal Zone, where she worked for six months as a civilian in a U.S. Air Force legal office. But the seeds for her job choice had been planted nearly a decade earlier, when her oldest brother paid for her to attend business school. Butterfield’s parents had died when she was 12, and her brother, the oldest of five children, had taken over as head of the family. From mid-1942 to 1948, Butterfield worked for the federal government on both coasts as a clerk-typist and a teletype operator. She then went to work as a secretary for a lieutenant colonel at Albrook Air Force Base in the Panama Canal Zone. The job gave her an opportunity to practice her shorthand, and in June 1951, she accepted a court reporting position in the legal office on base. Most of her work in the new position involved taking down testimony during court-martial proceedings. She received only on-the-job training. While in the Panama Canal Zone, she began dating a staff sergeant named Frank Butterfield. In July 1951, he was transferred to Massachusetts. Five months later, she followed him. They were married in December. Frank served in the Korean War until 1953. The couple moved a few times in the following years and did a short stay at Nellis Air Force Base. While in California in 1955, Butterfield learned about a job opening in federal court in Las Vegas. She took a train to Las Vegas and interviewed with then-U.S. District Judge Roger T. Foley. At the time, only four court reporters were working in Las Vegas. Three weeks passed before Butterfield received a response. The call came on a Friday, and she was asked to report to work for a trial beginning that Monday. She accepted the job, with its annual salary of $5,700, and temporarily left her husband behind in Los Angeles. The first of Butterfield’s three children was born in the fall of 1957. After that, she gradually became a freelancer, working out of her home and building her clientele little by little. Her husband actually tried his hand at court reporting but didn’t like it. He later operated billiard parlors in Las Vegas, mined gold and worked as a marketing representative for a cab company. When he died in February 2001 at the age of 71, the couple had been married 49 years. The court reporting business still carries the Butterfield & Butterfield name. Today’s stenotype machines are computerized, providing their operators with instantaneous transcripts that need only editing. Butterfield dictates her notes into a tape recorder. A transcriber then uses her tape to produce a transcript, which Butterfield proofreads. When asked why she still works with a pen, she explained that in the early years of her career, California had the nearest stenotype school, and she didn’t want to leave the state for training while she had three youngsters at home. When a school opened in Las Vegas in the mid-1980s, she figured she was nearing retirement. Besides, her method was working just fine. Through the years, Butterfield has taken the depositions of such celebrities as Johnny Carson, Buddy Hackett, Joe E. Lewis, Wayne Newton, Elizabeth Taylor and Frank Sinatra. “I don’t think anybody’s had a better time as a court reporter than I have,” she said.